The 26s and 27s were overhauled at Glasgow St. Rollox works. An overhaul was usually scheduled once every three or four years. The most obvious sign that a locomotive had paid a visit to the works would be its fresh coat of paint. The usual practice on completion of an overhaul was to send the locomotive on a test run. 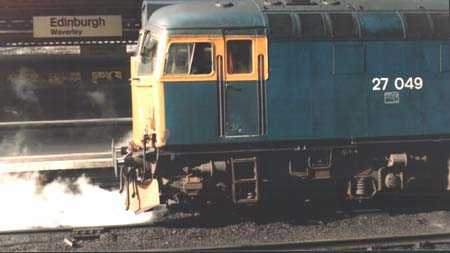 A one time popular choice was the 1038 Glasgow Queen Street to Perth service. The "Ex-works" locomotive would haul both the train engine and its train. In the event of problems the train engine would assist. On 4th June 1982 27040 is seen paired with 27106 on the train at Stirling. (Below). 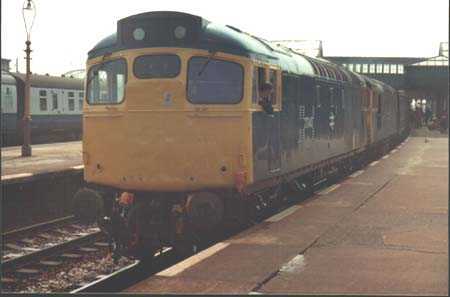 Oddly enough in that same year a few 27s headed south to Derby Locomotive Works for attention. 27014 had been out of use for some time and was sent for an intermediate overhaul. 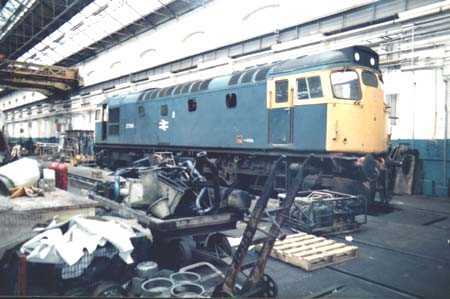 This was to be the very last overhaul on a vacuum braked locomotive. Looking a little out of place in No. 8 shop 1 bay (now knocked down), 27014 awaits stripping. The method employed to heat the carriages consisted of a steam boiler, which burnt diesel fuel. Nowadays electric train heating is used. 27049 demonstrates the good old method at Edinburgh!